Matilda is on the hard again for some repairs and the annual maintenance. This operation has not been straight forward but finally the rudder is remounted, hinge and nut covered in putty and the surface faired and ready for the final layers of primer and antifouling. Skeg antifouling applied – rudder in the background ready for remounting. Finding the right alignment was a bit tricky as can be seen by the bronze plates placed behind the hinge at the skeg. The two pieces at the rudder part (top of hinge) were probably not needed but left there for additional support. The amount of alignment and needed bronze plates will be different for every single HR352. Some won’t need any and others will need what you see above. The good thing is that the rudder works again smoothly as on a Laser dinghy. Rudder shaft nut covered in putty again (I have used Plastic Padding Glass Fibre Paste which worked quite well). Turniing on the lathe is fun. Here, the washer used for the lower bearing is being made (material is CuSn12). OK, let’s see what’s going on with the other issues. Among other things, there was the CENTA coupling, the Volvo shaft seal, the cutlass bearing and the ruder shaft seal. The rudder shaft was leaking a little but not through the packing box. The leakage was between the rudder shaft tube and the fiberglass laminate. Stuffing box housing removed from the rudder shaft tube. The sealing at this end was done by the means of silicone which could easily be pealed off. A big square pipe was used with two screws welded at the corners for unscrewing the stuffing box housing. It was an easy operation. New Volvo Penta propeller shaft sealing installed. CENTA AGM Coupling with new rubber part back in place. All screws were tightened according to the manufacturer’s instructions using a torque wrench (…of course :-) ). Cutlass bearing replaced and remounted. I have sealed part of the internal thread and the contact area to the hull with Sikaflex 291i. This ring, is supposed to be used at the location where the rudder shaft exits the hull. Together with some Pantera MS-3000/60 V2 Marine Sealant is should provide proper sealing and solve the leakage problem. A groove of 3mm depth was made around the shaft into the hull and the ring was placed into it with some Pantera MS-3000/60 V2 Marine Sealant. Matilda did not have enough for this summer, so I untied the lines and took her out for a little single-handed adventure to the island of Milos about a week ago. I started on Tuesday the 22nd at 6 pm and sailed through the night. A constant F5 was responsible for a fast passage to the island of Milos. 112 NM in 19 hours. I spent the next day exploring the island on a scooter. Since I wanted to be back on Monday next week, I left again on Friday in the morning ignoring the other sailor’s warnings because of the bad weather (the forecast was N F7). 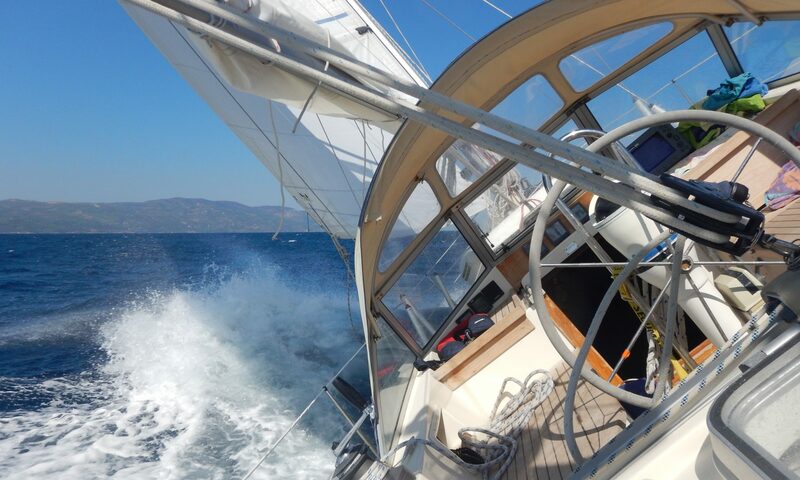 It was a relatively rough close hauled passage to Poros which I reached about 12 hours later. Average wave height was about 1.5m but some waves were double that height. The next day on the way to Cap Sounion the conditions were similar. I anchored in the bay underneeth Poseidon’s temple at Cap Sounion. The wind increased during the night and it was blowing at min F7 in the morning. After lifting the anchor, I rounded the cape and headed north into Makronisos channel which I believe was a mistake. Course and wind were both N and it was now blowing at F8. Because of the very steep waves, I was just making under 3 knots whilst running under engine at 2400 rpm. At the north exit of Makronisos channel, the conditions worsened and the waves became bigger, steeper and very confused. It was almost impossible to keep the boat on course and I was seriously considering turning back and going into Lavrion harbour for shelter. Conditions became better after a while and I finally decided to proceed. I arrived in Almyropotamos in the evening. It is amazing how you get used to the situation but I learned that it does not really make sense to fight against the weather in such conditions. If something goes wrong you may have a serious problem, especially if you are sailing solo. Anyway, the last day was perfect sailing at F5 and a moderate sea state and compensated for the “punishment” of the previous day.